POSTCARD #124: Bangkok: Ah well, life’s like that, we made a last minute booking after M went to Koh Krabi and Jiab and I got a flight to Bangkok. No traffic on Sunday so we were at the house before we knew it. 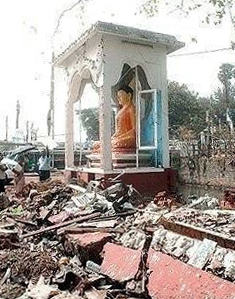 The plan is Jiab goes to the Bangkok office on Monday, leaves for Delhi Tuesday and goes to Kathmandhu in a few days to organize the rebuilding, after the earthquake, using local staff. ‘Bare-foot technicians’, on-the-job training, they get paid quite well, mostly clearing rubble and then re-establishing infrastructural stuff. It could take a long time. For a more up-to-date account of how things are check out garyhorvitz’s blog: Kathmandu Komment, Everything is Everything and more recent posts. I’ll go back to Ch’Mai and continue with care-taking duties of M until 16th May then back to Delhi. If I stop and think about it, I find I’m starting to take a position against it, locked into the suffering and looking for some kind of punishing way to develop the problem – a grasping reaction, I have the cause but no effect. Let the mind unstick from it, the karma of cause/effect/ flowing like a torrents in a river. Present time contained in the here-and-now of where I am, as if it were contained in a book I’m reading… open at the page where I was, re-enter at the same place and time when I was last here. I am a character in a story about a world seen through clouds of thoughts thinking thoughts embedded in this self I recognise as ‘me’. How am I to inhabit what remains of this lifetime, feels like I’m at the end of the railway track, can’t go any further, step down from the train and there’s this open view out to sea. 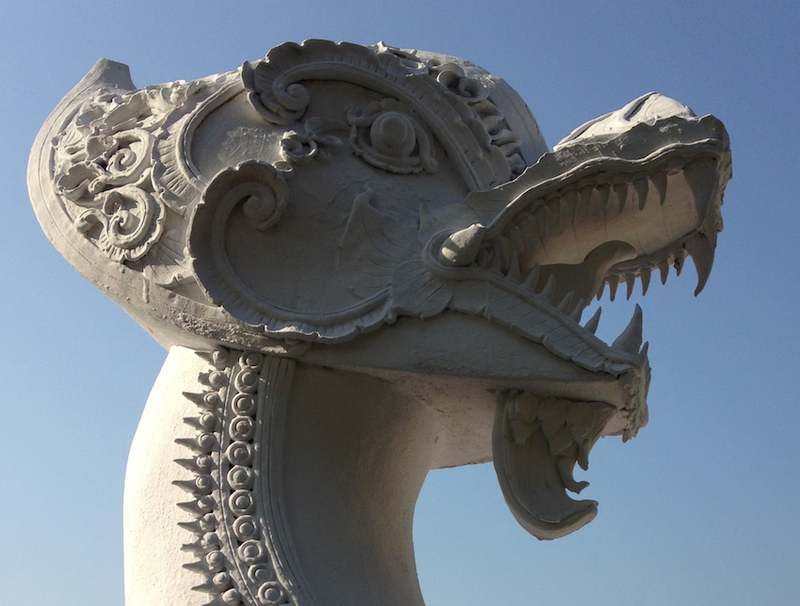 upper photo: a Thai mythological creature guarding the gates of a Buddhist temple. Funny how trying to live in the past or future always turns around and bites us, yet we still keep doing it. Maybe because living entirely in the present – without aspirations or regrets – is considered so immoral and pathological other people will likely step in and impose their plans upon you. Though I guess you wouldn’t worry about that possibility if you weren’t trying to live in the future. The Australian utilitarian moral philosopher, Peter Singer, actually measures the value of lives according to how comprehensive their aspirations are (so he believes it is not immoral to kill a disabled infant because it has not yet begun planning its future). So by Singer’s measure, the life of a psychopathic despot who dreams of a Thousand Year Reich is worth infinitely more than that of an enlightened being who never looks beyond the here and now. Most people are so busy working they don’t have the peace of mind to consider the present moment (that’s the way it was planned of course), so they can’t be blamed for not understanding. What to do? The kinds of things we’re talking about here develop in adversity, like what are commonly known as weeds, which do seem to proliferate at a surprising rate. What we need are some exceptional young academics looking for a unique PhD subject and it could be the study of weeds. I think you’re right about Singer and controversy. When you speak to him he’s reasonable and polite and mostly seems to concede any points you make against his ideas or his methods of promoting them (which tend to stigmatise the disabled, for example). But a few days later someone sticks a microphone in his face and he’s making the same old assertions in the same old offensive way. I guess it’s a sort of academic ju-jitsu in which he only pretends to engage with different viewpoints. I find it hard to believe he would be well known for his moral philosophy were it not for the controversies. A kind of philosophical shock-jock. His sister is actually a prominent disability activist who takes a strong stand against precisely the sort of stigma Singer promotes, but I’ve never heard her criticise him directly. The sibling thing can be complicated. As for Singer, if he can change personalities like that, he must have a screw loose and using the eccentricity to create something he thinks is special. he must have a screw loose and using the eccentricity to create something he thinks is special. Funny you mention that. According to Koenigs, et al, strongly utilitarian morals are indeed correlated with having a ‘screw loose’ (i.e. damage to the ventromedial prefrontal cortex). Mind you, I’ve always thought pathologising those who have different moral, social or political views is a bit of a cheap shot, but nonetheless think it ironic that a man who claims the lives of the disabled are worth less than that of others may think that way because he’s seriously disabled himself. I don’t know if busy-ness is really an explanation for not being in the moment. You can be working very hard while ‘in the zone’. What’s more, doing so is generally productive and enjoyable. One of your commenters recently pointed me to an Alan Watts lecture on youTube in which he argues that we’re taught from childhood to always defer enjoyment and that’s why we’re always planning for the future that never comes. I never took cameras on my travels and was always bemused by people who seemed to think the point of a holiday was to show the snaps to people later. It must be even worse now that you can post today’s photo montage onto Flickr or Facebook tonight instead of having to wait to get home to inflict a slide show on family and friends. Is the prognosis so dire? Don’t feel you have to answer. Yes, the day we die will be an ordinary day and the birds will still sing and that is the cruelty of it all. For those left behind hearts will be broken never to heal to original state, Toon Ting. You are precious and okay, maybe merely one in 8 billion forms of consciousness but a unique form and irreplaceable. Tears. So everything comes to an end while nothing ever finishes? If time exists it must be nothing but a series of stop-start interruptions. Another dimension of separation.